Build to Order Die Formed Olds Sheet Metal Intake Manifold. 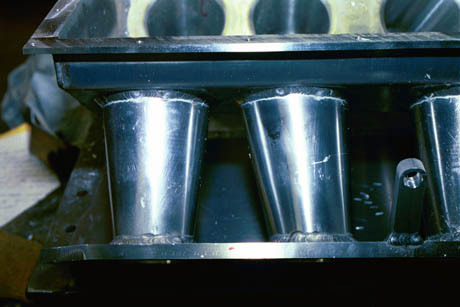 This is our die formed fabricated Olds. Pro Stock sheet metal intake manifold. First we C.N.C. machine tapered round runner blanks. Then we machine male- female dies. Next the runner blanks are pressed into Dies. The Customer said I cheated. 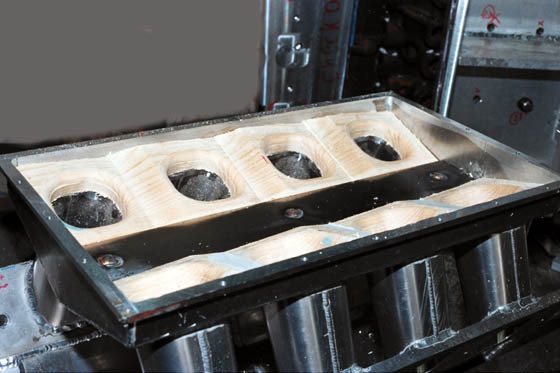 We build to order or build to print die formed fabricated sheet metal intake manifolds. What can we build for you? Twisted Intake Port Die Formed Pro Stock Sheet Metal Intake Manifold. This is our C.N.C. Machined Twisted Intake Runner Intake Flange Plate. 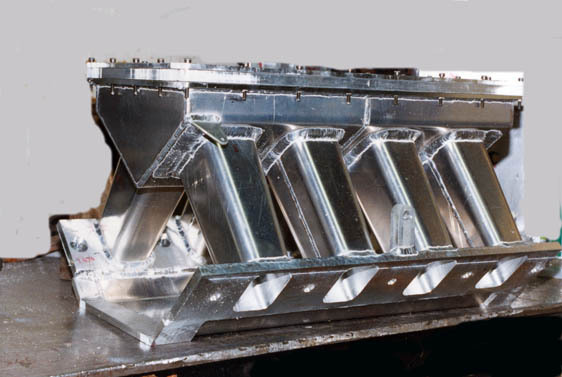 We built die formed tapered rectangular intake runners. Then we a machined male Rectangular to round taper. We then pressed the male taper into the rectangular runners. Pro Mod Die Formed Sheet Metal Intake Manifold. We build to order carburetor or E.F.I. sheet metal intake manifolds. You can order your sheet metal intake manifold with 2, 3 or 4 stages of Nitrous. 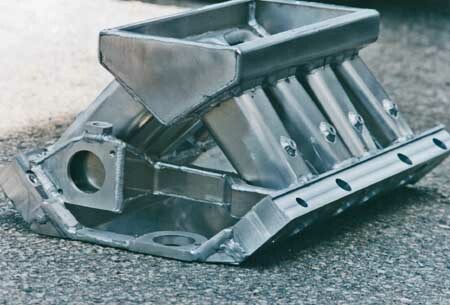 All our aluminum sheet metal intake manifolds use precision die formed intake runners. 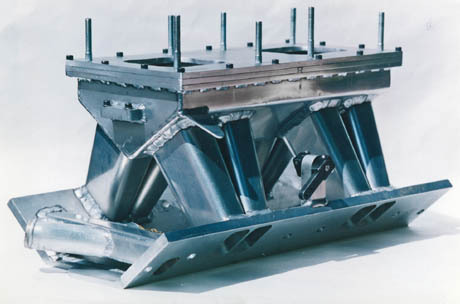 We build matching die formed plenums. We have built C.N.C. machined intake manifold halves for vintage race cars. Big Block Chevy Die Formed Sheet Metal Intake Manifold. 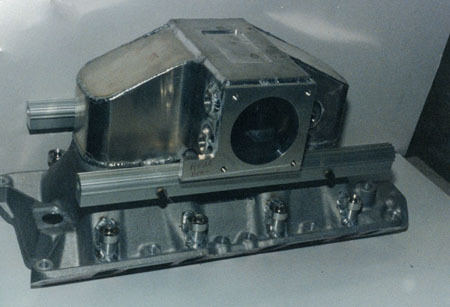 Our first sheet metal intake manifold was built for a big block Chevy Pro Stock engine in1986. 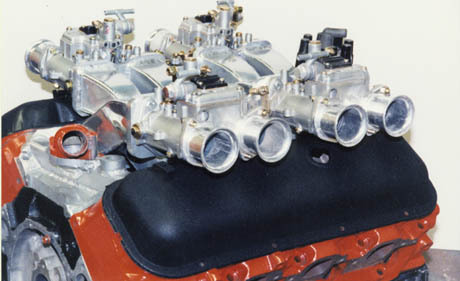 We can build manifolds for any brand of big block Chevy cylinder heads. Small Block Chevy Sheet Metal intake Manifold. We build bracket acing, comp eliminator, Pro Touring and Pro Street small block Chevy intake manifolds. We fabricate Small Block Chevy turbocharger sheet metal intake manifolds. Super Stock Die Formed Sheet Metal Intake Manifolds. We build Super Stock die formed sheet metal intake manifolds for all Super Stock cars. Bracket racing and Comp Eliminator cars use Build and Tune sheet metal intake manifolds. We build Small Block Chevy sheet metal intake manifolds for Pro Street and Pro Touring cars. 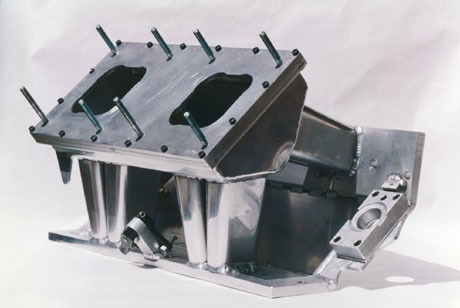 We build sheet metal intake manifolds with universal distributor mounts. Our universal distributor mount allows the engine builder to properly set the distributor height. Our universal distributor mount enables you the switch the entire top half between Pro Stock Oldsmobile or Pro Stock Chevy engine blocks. Pro Stock E.P.D. P4 P5 P6 Pontiac Sheet Metal Intake Manifolds. 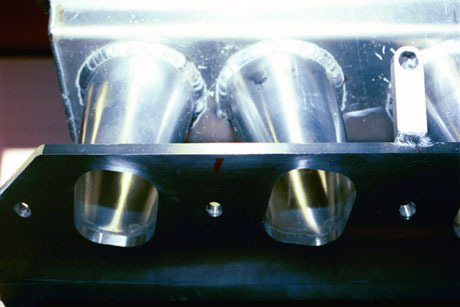 Build and tune built Die Formed Pro Stock Sheet Metal Intake Manifolds for many E.P.D. 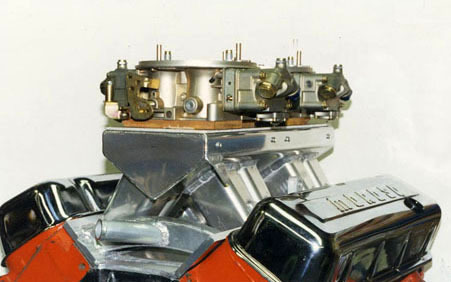 style Pro Stock Engines. 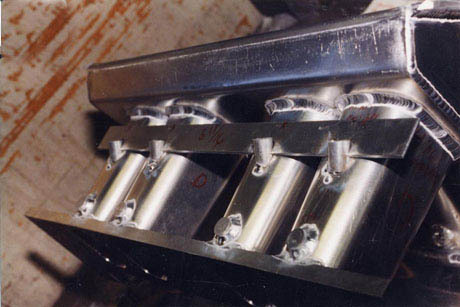 These Intake Manifolds were built with many different runner openings, plenum heights and distributor combinations. Wayne County Dodge B1 T.S. Pro Stock Sheet Metal Intake Manifold. 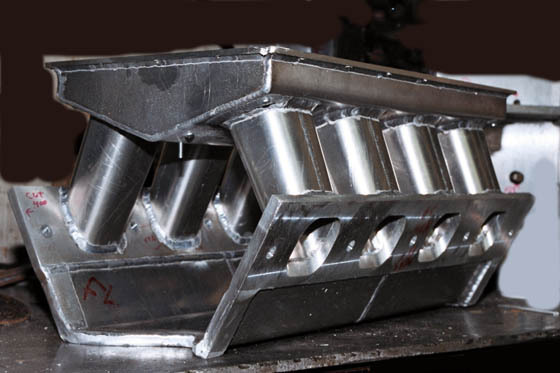 This is one of six Build and Tune die formed aluminum sheet metal intake manifolds built for W.C.D. Note the water fittings on front and middle of flanges. Note the absence of nitrous fittings or Provisions for nitrous fittings. We will install nitrous fitting any where the customer wants. 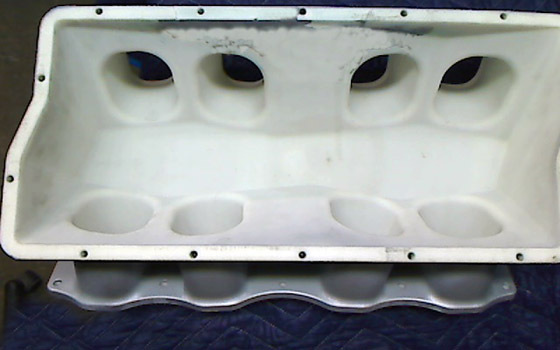 1996 Ford Hemi Pro Stock Die Formed Sheet Metal Intake manifold. We built this manifold on a new Ford Pro Stock low deck block. The plenum has an outside flange and is set low to accommodate adjustable runners and adjustable plenum heights. 1996 Ford Hemi Adjustable Intake Runner Opening Intake Manifold. 1996 Ford Hemi Adjustable Intake Runner Opening Intake Manifold. We built different thickness wood runner entrances to test different runner lengths and runner openings. Note our radical runner opening design. Note the runner openings and runner lengths can be changed. 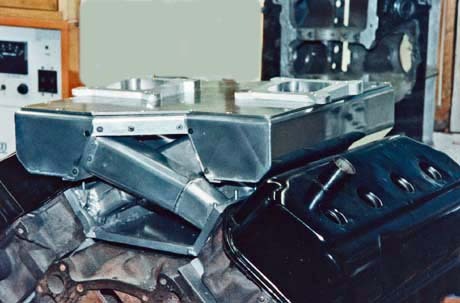 Note the plenum height and volumes can be adjusted. Remember this is 1996. Top Secret 3D Printer Ford Pro Stock Hemi Plastic Intake Manifold. 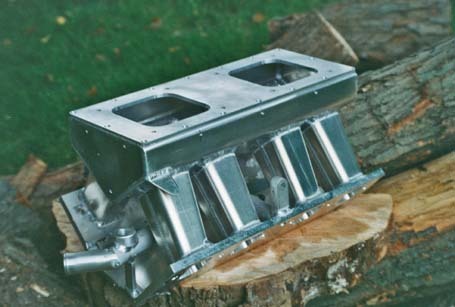 Compare our Build and Tune die formed aluminum sheet metal intake manifold with this photo. Note the shape of the plenum and runner entrance is similar with what we did 17 Years ago. 426 Hemi Super Stock Sheet Metal Cross Ram Intake Manifold. 23 years later Our 426 Hemi Super Stock cross ram aluminum sheet metal intake manifold is still a good manifold. 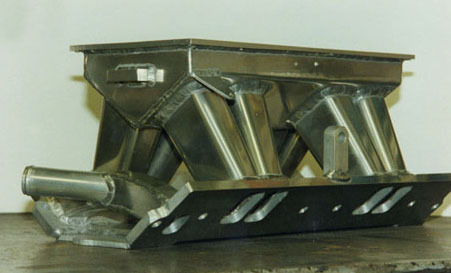 Both plenum sides are removable and the plenum top can be raised. We used 1/8 inch thick 2 piece die formed aluminum intake runners and plenums. Big Block Chevy Weber Cross Ram Custom Sheet Metal Intake Manifold. Big Block Chevy cross ram manifold for sale. We built this manifold for a 1974 corvette with power brakes 31 years ago. 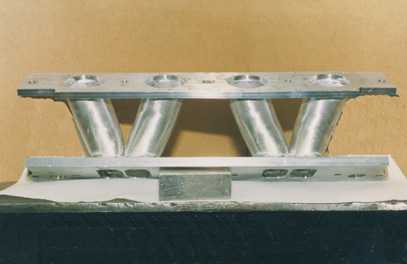 Each intake runner is four pieces. 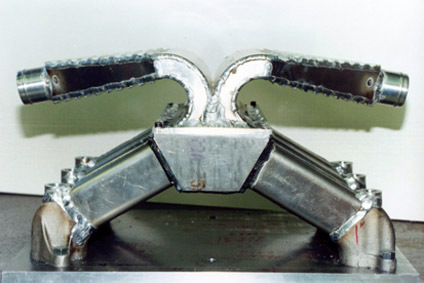 Each runner side is cut from its own pattern. You must use stock valve covers with this manifold. With slight modifications a H.E.I. distributor will fit. 427 Ford Tunnel Port Die Formed Sheet Metal Intake Manifold. 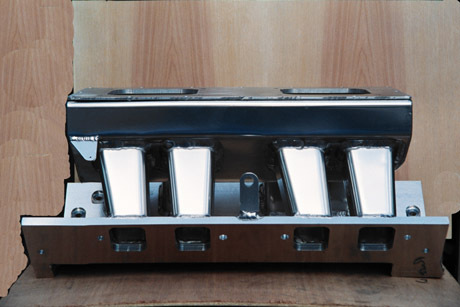 We build die formed sheet metal intake manifolds for Ford tunnel port, Ford hi rise and Ford hemi S.O.H.C. Engines. Buick Pro Stock Die Formed Sheet Metal Intake Manifold. E.P.D. modified Pontiac P4 style cylinder heads were modified to be all long port heads. This engine made great horse power but did not accelerate well. 308 E.F.I. Turbo C.N.C. Machined Sheet Metal Intake Manifold. Maserati Bi Turbo E.F.I. Twin Diffuser Sheet Metal Turbocharger Manifold. 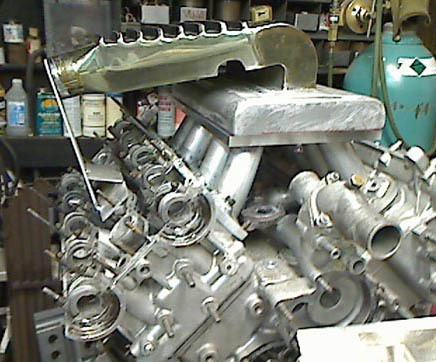 302 Small Block Ford Cast E.F.I. Blower Manifold. Slide Throttle Sheet Metal Intake Manifold.